Sometimes you really do count your blessings. There I was, in November 2016, setting out from Louisburgh Co. Mayo on a cold wet autumn morning, wondering whether my right leg, mildly strained in a recent tennis match, would manage the eleven-mile famine walk to Doolough. How trivial an ‘injury’ in the context of the 1849 tragedy the walk commemorates. Hundreds of starving men, women and children, ordered to tramp those eleven miles to Delphi Lodge, were denied an audience, let alone the relief they sought, by the men of power. Many died by the roadside on their despairing return trail. Afri’s Famine Walk happens each May, but this was a re-enactment for BBC Radio 4’s ‘Ramblings’ series. 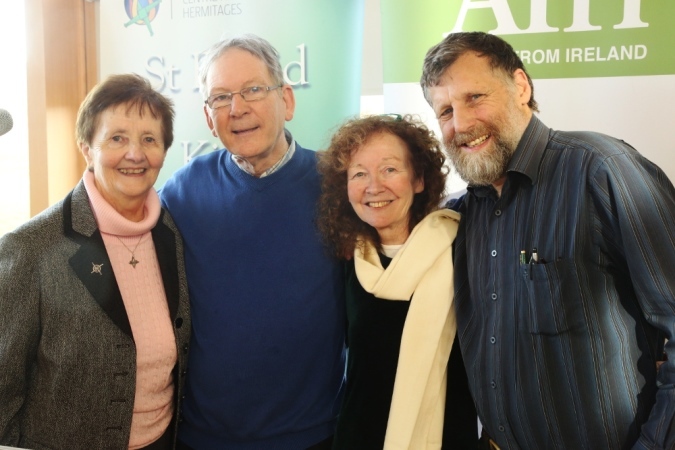 Local historian Mary O’Malley painted a poignant scene around her own family story, and Joe Murray set the context of Afri’s work for justice, human rights and sustainability. Yours truly was to handle ‘the broader history’; thank goodness for Cork University Press’s superb Atlas of the Great Irish Famine! Its unique blend of scholarly analysis and humane reflection dispelled some of my clouds of ignorance about that great lacuna in our history and culture. The Atlas breaks the twin silences of the survivors and the scholars, whilst respecting the irrevocable silence of the over one million victims. It allowed me to sketch some of the broader background to Doolough’s tragedy, along with some nuggets of salutary and surprising information. Things I never knew: fish and seafood did form part of the pre-Famine fare of those who could obtain them. Ireland’s potato-based diet, though fatally precarious, made the pre-Famine population healthier than the European average. 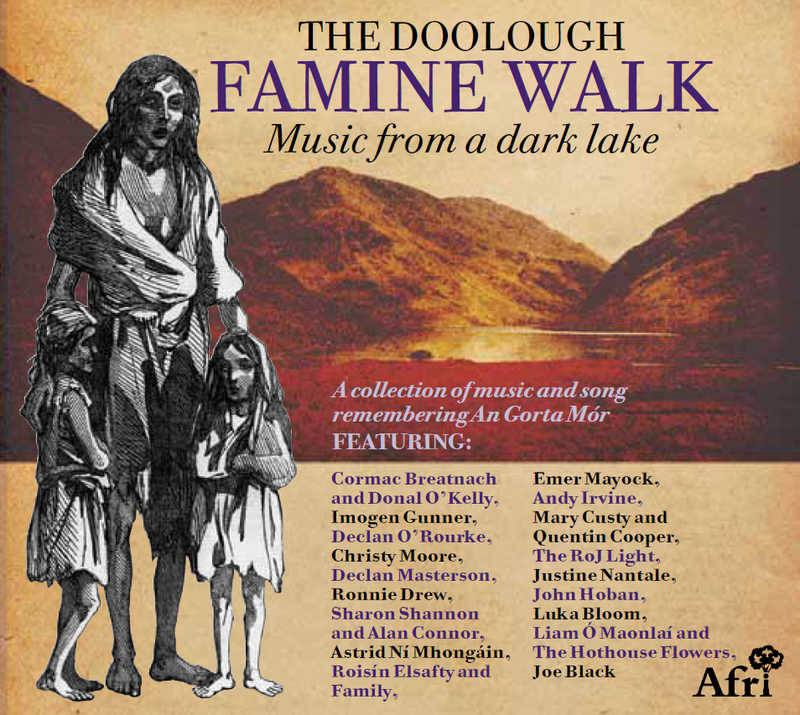 For 30 years Afri has walked the famine road through the Doolough Valley in County Mayo. It is a walk like no other, abounding in memory, music, history, solidarity and spectacular beauty; retracing the steps of the dispossessed of the past and forging solidarity with the banished and oppressed of today. 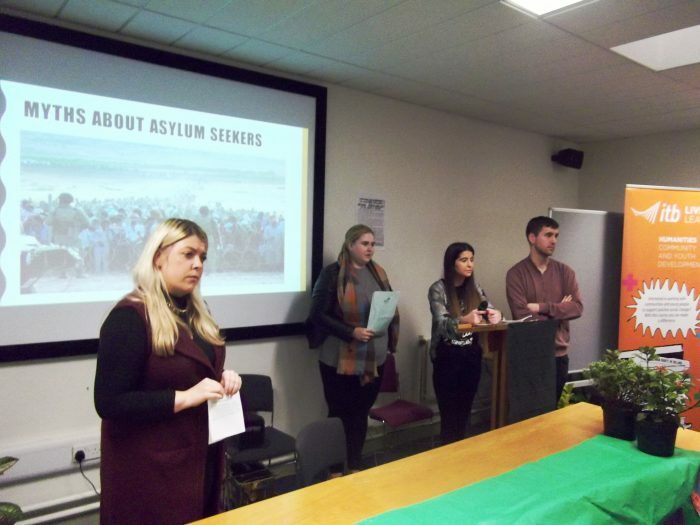 The 2017 walk linked the experience of Irish people fleeing on coffin ships or being condemned to workhouses during An Gorta Mór in the nineteenth century with those crossing the Mediterranean in flimsy, rickety boats today, some of whom, if they survive, may end up in Direct Provision Centres for asylum seekers in Ireland. 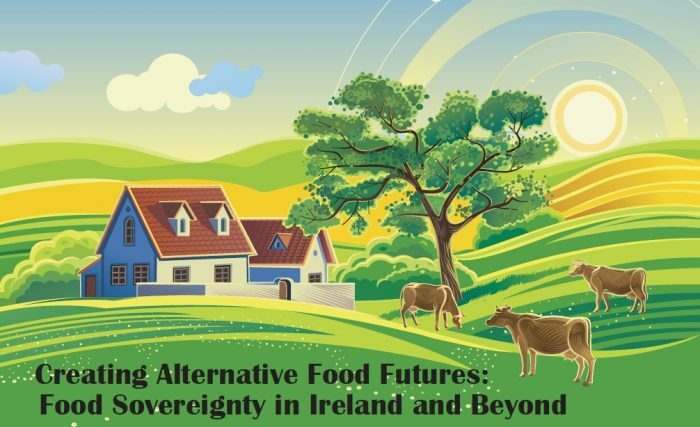 A short film made by RoJ about the Food Sovereignty event held in NUI Maynooth in April. “I feel humbled and yet honoured to be here today. I have found it a challenge to say a few words, I actually wanted to say no without giving this a thought, but remembered those that have walked this path before, the people that sacrificed their lives to seek relief for the masses of their village, they did not second guess themselves they took the challenge with swiftness, in the worst of weather and on empty stomachs with nothing but the will to survive. 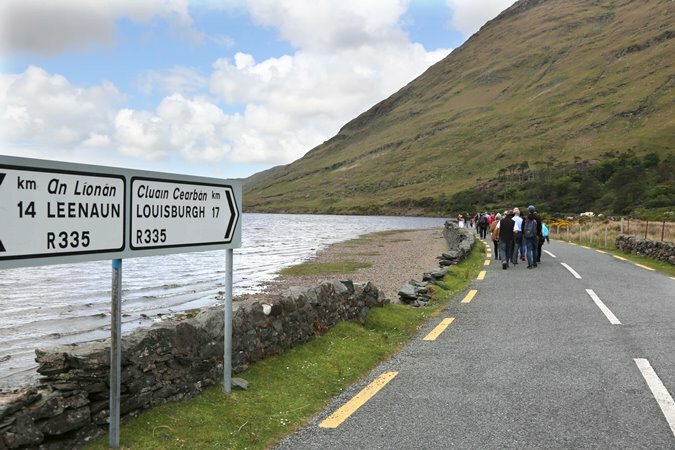 On 20th May 2017 a couple of hundred people set out on the 11 mile walk from Doolough/Delphi Lodge for Louisburgh in bright, early summer weather, and it remained dry and bright. They had earlier heard Joe Murray, Danny Cusack and Donnah Vuma speak, and Joe Black sing. The theme, of this the 30th annual walk, was not just the commemoration involved in the Famine Walk but the inhumanity of the Direct Provision system for asylum seekers in Ireland today which treats people not as human beings but as numbers. A tree was planted in Delphi Lodge which again welcomed walkers, a stunning contrast to 1849. These are The Facts. Famine Walk 2017: From Hunger and War…to a Home and a Welcome? ‘Bog Cotton’ by Choctaw artist Waylon (Gary) White Deer. 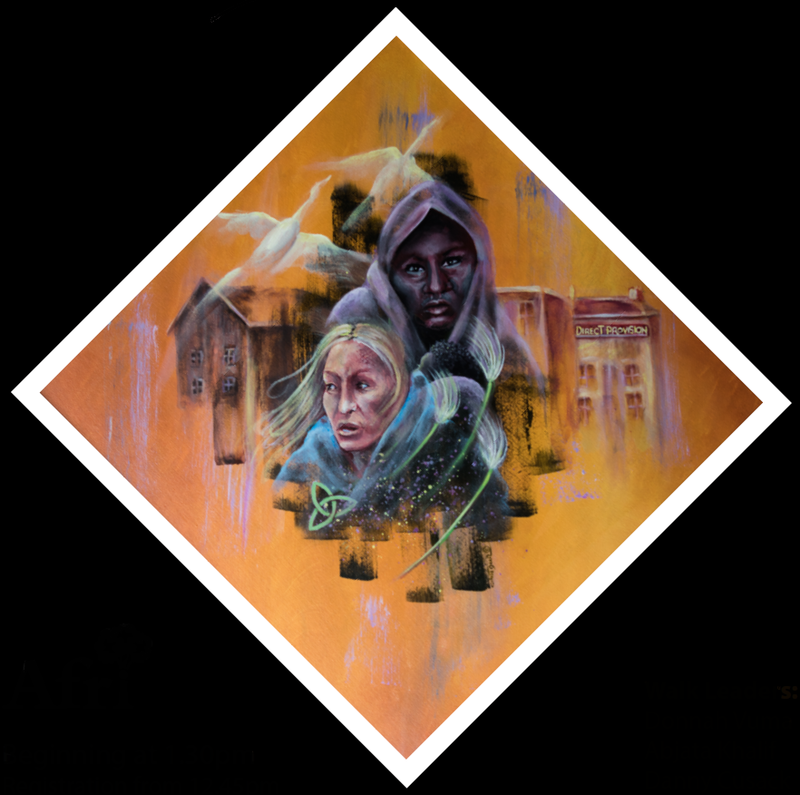 The painting, among other things, features the Workhouse and the Direct Provision Centre. 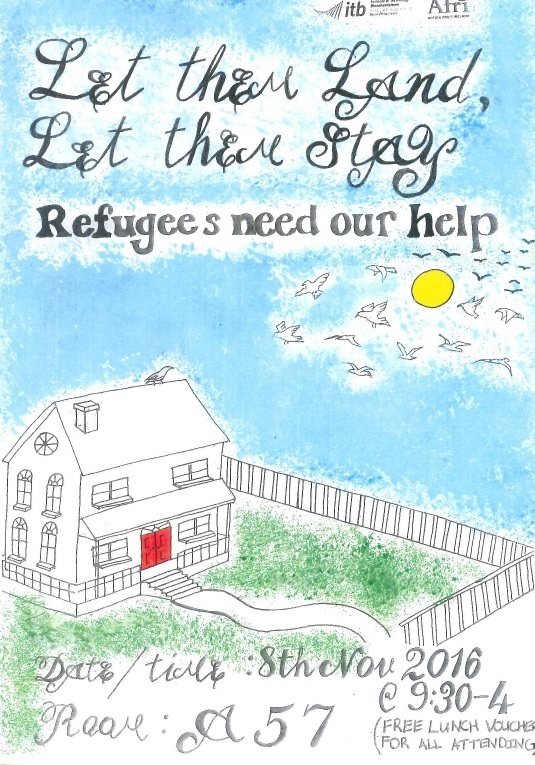 From Hunger and War…to a Home and a Welcome? When we look at the many problems confronting our world, we can sometimes think that things are worse than ever and that little progress has been made towards creating a more just and compassionate world. But it is important that we keep in mind the progress made, as well as the challenges that continue to face us. Students from Beneavin De La Salle College, Finglas Dublin are given a tour of the Dunshaughlin Famine Graveyard and Workhouse and are told harrowing stories of the poorest people from days gone by. Afterwards they are honoured by Kathy Kelly who shares her amazing experiences fighting for justice and peace. Pete Mullineaux then holds a conscious workshop where the students are asked to demonstrate all the good things the world has to offer. Thirty years on the ‘Famine Road’ have generated many memorable moments and iconic images. On the first walk in 1988, walk leader Donncha O Dulaing arrived by helicopter to join Niall O’Brien, recently released from prison in the Philippines, and Mayo woman Caitriona Ruane, recently returned from Central America, before leading us off on the first ‘chapter’ of this extraordinary journey. The following year, Brian Willson, having lost both legs while attempting to stop a train delivering arms from the US to Central America, was applauded as he bravely crossed the finishing line. Desmond Tutu and his wife Leah were almost blown away with the force of the gale that blew up when they led the walk in 1991. It helped us all to understand a little better how it would’ve been for the hungry poor of 1849. The voices of Juana Vasquez and Dario Caal, representing the Maya from Guatemala, echoed off the mountains as they spoke at the edge of Doolough about the importance of solidarity and how they believed they were walking with the spirits of our ancestors through the sacred Doolough valley in 1995. And then the gates of Delphi Lodge were opened to the walk in 2013. We walked through the gates solemnly carrying the names of those who had died in the tragedy of 1849 and the names of those who died of hunger in our own day, in our world of plenty. We planted an oak tree, we planted potatoes supplied by Willie Corduff of Rossport and we listened to the deeply emotional rendition of ‘Connacht Orphan’ sung by its author, Declan O’Rourke. Join us for the 30th Walk on May 20th 2017 where more extraordinary moments are sure to be generated. 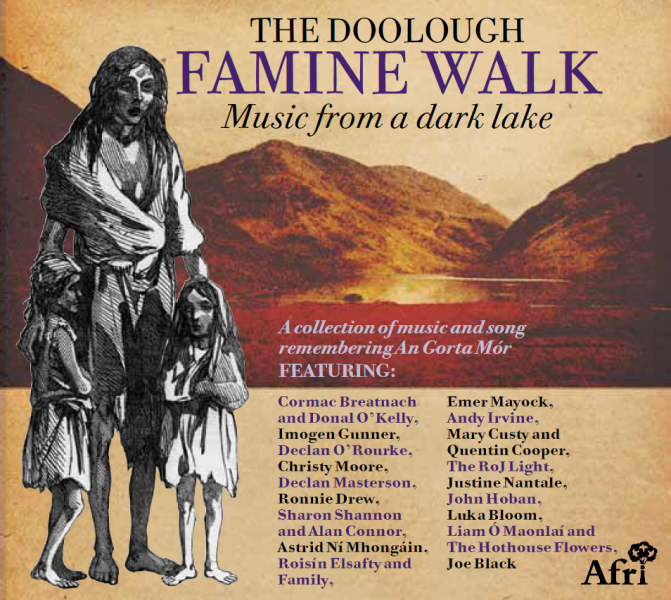 Afri’s annual Doolough Famine Walk was featured on BBC Radio 4’s ‘Ramblings’ show and was selected as BBC Radio 4’s ‘Pick of the Week’ on Sunday 19th February. Listen to the show here. To register online go here or check out our facebook event page. 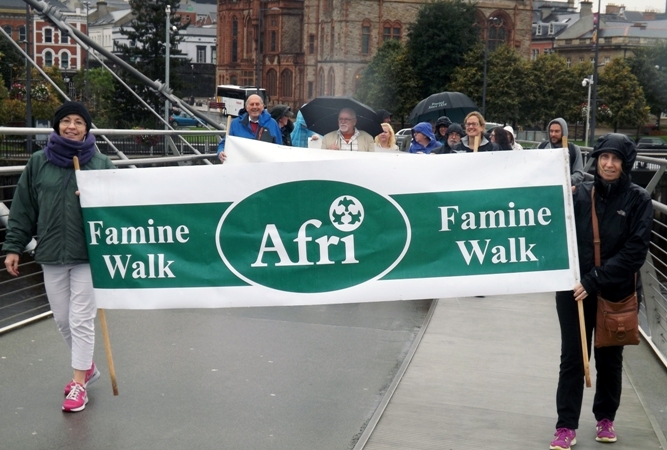 If you are planning on doing the Famine Walk please contact the Afri office for a sponsorship card – admin@afri.ie or 01 8827563. Please assemble in Louisburgh for registration at 12.45pm. There will be an approximately 15 min opening ceremony, including speakers and music – this is a very important part of the Famine Walk and we would encourage all participants to be present for this part of the event. Buses will bring walkers to start point from 1.30pm. A tree will be planted at the start of the walk at the Famine Memorial in Delphi Lodge before walkers return to Louisburgh. There is no parking available at Delphi Lodge. The walk is approximately 11 miles (18 km) and a shuttle car will be available along the route if needed. Comfortable shoes, raingear and water are strongly recommended. Tea/coffee (but not food) will be provided at a halfway point along the way. There will also be toilet facilities at the halfway point as well as along the lake. IN THE INTEREST OF HEALTH AND SAFETY, PLEASE WALK ON THE LEFT HAND SIDE OF THE ROAD FOR THE DURATION OF THE WALK. We are asking participants to consider raising sponsorship for Afri, so that we can continue our important work. If you would like to do so, please get in touch with the Afri office and we will post you out a sponsorship card. If you would prefer not to raise sponsorship you can register online here or pay €24 on the day – which includes the registration fee and cost of the bus to the start of the walk. 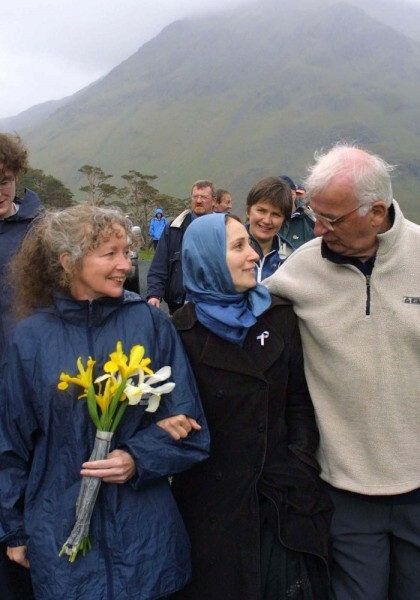 Peace Activist Kathy Kelly (left) with Nuria Mustafa (Centre) and Jack Hynes (right) at Afri’s 2003 Famine Walk in Mayo. This morning, here in Minneapolis, I’ll learn whether six jurors believe beyond a reasonable doubt that Dan Wilson and I are criminals. 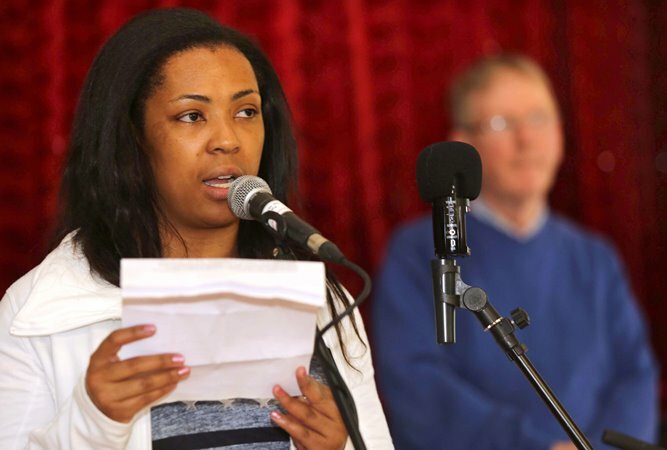 The court case stems from an action protesting the execution of Jamar Clark, age 24, who died in the early morning of November 15, 2015 outside a north Minneapolis apartment complex. Two Minneapolis police officers, Mark Ringgenberg and Dustin Schwarze, were involved in the shooting. Jamar Clark died after a bullet was fired directly into his head. Several witnesses say that he was handcuffed and motionless when he was shot dead. The police officers have been cleared of all charges and are back on the job. Among the issues to be explored at this year’s conference will be forced migration – the inevitable consequence of war and climate change. Speakers will include distinguished peace activist and author Kathy Kelly and Scottish writer and campaigner Alastair McIntosh. Find out more in our brochure. To book tickets online go here or download the booking form and send to Afri by post. To see who’s going on facebook go here. The 2016 Hedge School took place in Blanchardstown on November 8th, the same day as the US presidential election. To our surprise, the latter event seemed to overshadow the former! However, we are confident that the outcome of the Hedge School will be much more positive and beneficial to people and planet than that of the election! The election was a contest between two corrupt multi millionaires supported by arms companies and oil companies while the Hedge School was organized on a shoe string and with the good will of many people. Sorcha Pollak opened proceedings with a powerful talk on Roger Casement. Casement was a great humanitarian and internationalist, who, having carried out an investigation into atrocities on Belgium rubber plantations in the Congo, was sent by the British government to the Amazon jungle to investigate atrocities committed by the Peruvian Amazon Company, which collected rubber in the region of the river Putumayo. Casement was executed four years later for his participation in the 1916 Rising. John Maguire further explored Casement’s work in the context of his deepening awareness of the evils of Empire and of its implications for his beloved country and characterised him as an ideal symbol for today. Other speakers included Kay Mulhall and, the highlight of the day, Miriam, a former asylum-seeker from Uganda. Miriam spoke about the gruelling circumstances of her life in Uganda before being forced to leave her country and seek refuge in Ireland. In Ireland she experienced the Direct Provision system which poured salt in the wounds of her previous suffering. The students made a tremendous contribution to the day in terms of both organisation, and input. They interwove workshops, music and the writing of a Proclamation into the fabric of the day. Special thanks to Liam McGlynn whose support, collaboration and enthusiasm adds to the very positive experience of working in ITB. In our history, Hedge Schools were places of learning, continuity and resistance, emerging out of the draconian Penal Laws that forbade formal education to most Irish people. Learning about and resisting the causes of poverty is at the heart of Afri’s work and the Hedge School symbolizes the kind of resilience and creativity needed to address the crisis facing our world as a result of climate change and the obscenity of the war industry. 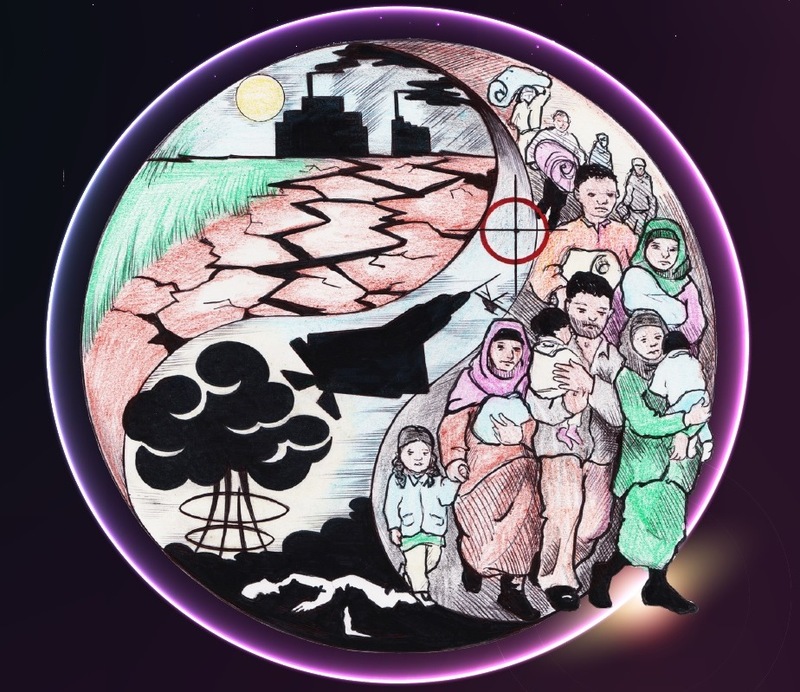 One of the major consequences of war and climate change is forced migration and what has become known as the ‘refugee crisis’. The 2016 Hedge School will explore this theme and will include input on Roger Casement, the great internationalist, humanitarian and executed 1916 leader as well as provide an opportunity to hear from refugees & asylum seekers in Ireland. This year’s Hedge School is organised in partnership with the students from I.T. Blanchardstown. To register for the conference, please email admin@afri.ie. Choctaw heirloom squash grown at Glenveagh National Park this summer to be shared at the Samhain Harvest: Food, Famine and Growing Within Seminar in Falcarragh, Co. Donegal. There is an emotional condition that most of Ireland doesn’t know it’s being affected by, experts are saying. 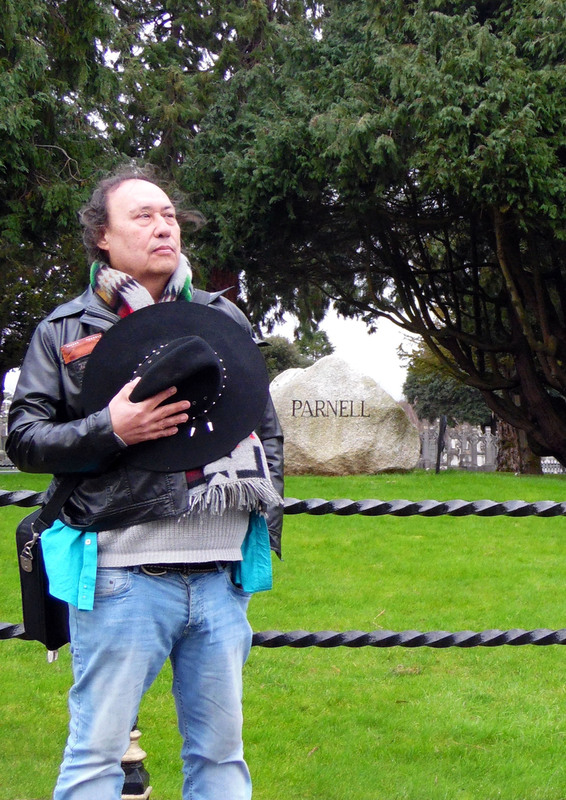 Malignant shame, or post colonial stress disorder is ever present in Irish society today. “It’s important to keep in mind that we are only beginning to understand inter-generational trauma. This type of trauma is often unknown or unrecognised by those who endure it” says Maeve Peoples, a Dublin psychotherapist. Increasing evidence is showing that the untreated effects of holocaust are passed on to future generations. “By looking at inter-generational trauma in societies as diverse as third generation Jewish holocaust survivors and aboriginal tribes people in Australia, we now know that recovery is possible. From these studies we learn to find the source of issues as diverse as food addiction, eating disorders, increased levels of suicide, alcoholism and drug addiction to name but a few. Identifying the source of the problem allows us to begin to address it” Peoples added. Maeve Peoples will be leading a discussion about Famine trauma at “Samhain Harvest: Food, Famine and Growing Within” organised by the Afri Choctaw-Irish Famine Landscape Project. The seminar is sponsored by Action from Ireland (Afri) and Concern Worldwide and begins Saturday at 11:00 AM in The Yard, Falcarragh. The afternoon session will highlight food sovereignty, security and solidarity. Admission is free and the seminar will end with a Samhain celebration. A small but enthusiastic crowd gathered on the Guildhall steps in Derry on a wet weekday afternoon, 21st September 2016 (International Day of Peace), for a famine walk. They were welcomed by Mayor Hilary McClintock. From the Guildhall the walk went to the former Poor House at Glendermott Road and then on to St Columb’s Park House for refreshments and chat. As a regional and transport hub, Derry would have received many starving incomers during the Great Famine, presenting themselves at the Poor House door where the famine walk stopped and remembered those who suffered and died. Organised by Waylon Gary White Deer for Afri, with Concern backing, the walk leader was Linda Ervine of the Turas Irish language project at East Belfast Mission, some of whose members came on the walk. Linda Ervine drew attention to the fact that the Protestant community, and she is from a Presbyterian background, also suffered in An Gorta Mór, but that history had been hidden. Other speakers included Waylon Gary White Deer, Rob Fairmichael for Afri, and Helen Henderson of St Columb’s Park House, and sean nós singer Noeleen Ní Cholla performed a couple of songs including Éirigh suas a stóirín. 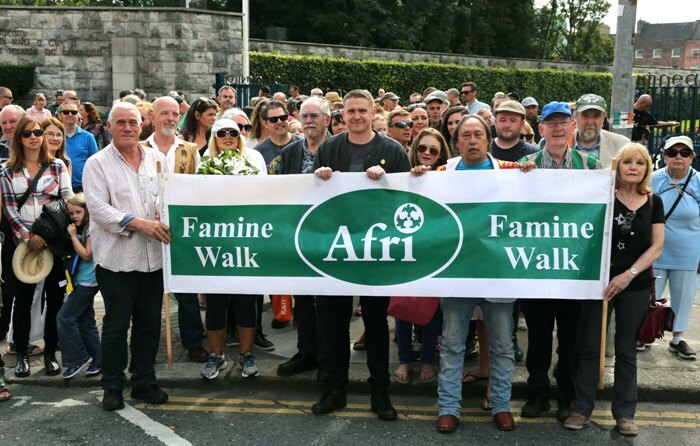 This Walk was part of Afri’s Famine Landscape Project and was organised in partnership with St. Columb’s Park House. These were the words of Damien Dempsey as he spoke at the Famine Walk which began at the Garden of Remembrance and ended at Glasnevin Cemetery on Saturday, August 27th 2016. 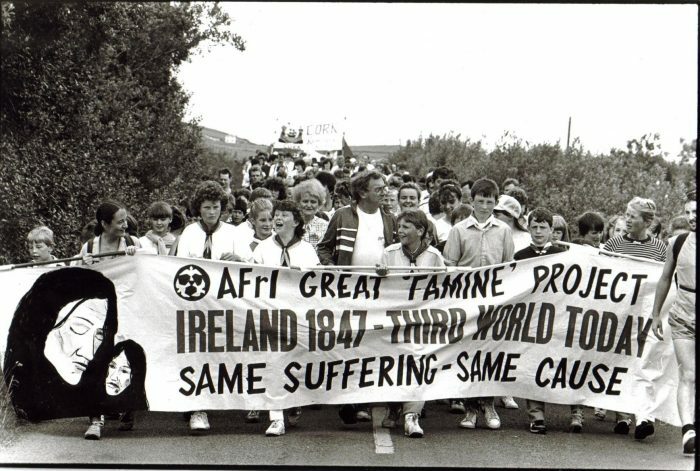 The theme of the walk was ‘Gan Bia, Gan Béal, Gan Ainm” (Without Food, Without Voice, Without Name) and it was organised as part of the Afri-Choctaw Famine Landscape Project. To mark the national famine commemoration day a famine walk was held in Drumshanbo on Sunday, September 11th 2016. The walk took place from St Patrick’s Church to the famine graveyard a short distance away, where a wreath was laid and a tree planted to the memory of the famine dead. 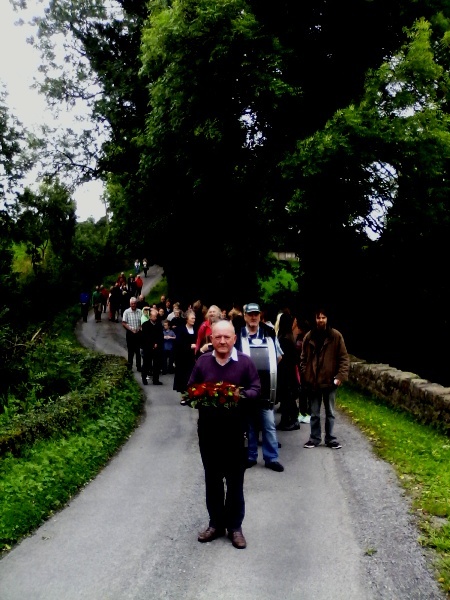 The walk was organised by Bryan Ryan a student of Drumshanbo traditional music school run by Mossie Martin.